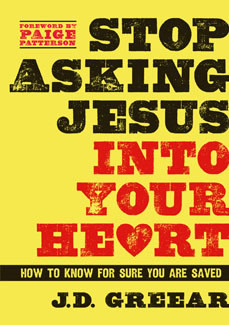 Stop Asking Jesus into Your Heart by J. D. Greear was published in February 2013 by B&H Publishing Group. In this neat little hardcover, designed in a funky yellow with a bold, all-caps title, J. D. Greear chastises the revivalistic, fear-mongering and guilt-driven type of gospel preaching that demands of the listener an in-the-moment “decision for Jesus” and then leaves them confused. All of the clichés of this type of evangelistic preaching—“the sinner’s prayer,” “asking Jesus into your heart,” “getting saved” (p. 41), etc.,—are dealt with in a balanced and biblical presentation. I know of no other book that does this in such an easy-to-read and simple manner but also in a weighty, instructive, faith-building style. Pastors who labor to get people into the kingdom but lack ability in teaching them how to live in the kingdom need to read this book. The main thesis, argued in different ways throughout the book, is stated in the first chapter like this: “Salvation is not a prayer you pray in a one-time ceremony and then move on from; salvation is a posture of repentance and faith that you begin in a moment and maintain for the rest of your life” (p. 5). Greear goes on to show that assurance and obedience will flourish if it is rooted in this soil of true conversion (see p. 109-110). [his] heart five thousand times” (p. 1), and he “prayed the sinner’s prayer again. And again. And again” (p. 2). Something else I like about this book is that Greear, frustrated with the shallow decisions pried out of a guilty and eager ignorance at an altar call, does not go to the other extreme. He believes that the sinner’s prayer is a biblical concept and that asking Jesus into your heart is not wrong in itself or un-biblical. His concern is that it is grossly misleading because it leaves so much more out of what happens at conversion that is equally important, the sealing of the Spirit, the washing of the blood, one’s name being written in the Lamb’s book of life, etc. (p. 8–9). These are the aspects of conversion that bring me comfort and assurance. Greear assures us that “salvation comes, not because you have prayed a prayer correctly but because you have leaned the hopes of your soul on the finished work of Christ” (p. 11). Stop Asking Jesus into Your Heart is an excellent presentation of the gospel, or—as Page Patterson put it in the forward—“a profound reflection on the nature of salvation” (xiii). This is a book to give to seeking sinners. It will draw them in to Christ to take refuge in Him. It will encourage you not to presume on the doctrine of “eternal security” but to understand it correctly; “it’s not incorrect to say; “once saved always saved.” It’s just incomplete. It is also true “once saved, forever following” (p. 86–87), because “faith that fades is not saving faith” (p. 79). This book will encourage you not only to look for evidences of salvation but also to rest continually in the accomplishments of Christ. Buy it, read it, live it, and pass it on. This book is offered for $0.99 on Amazon for Kindle today.